September 7, 2018 By Todd Burgreen & filed under All Articles, Handguns, Weapons. 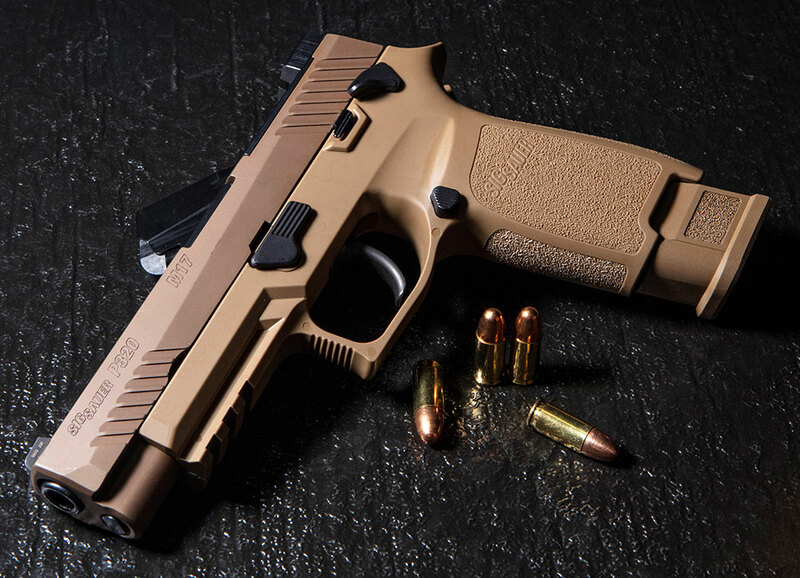 SIG Sauer P320-M17 is a civilian clone of the U.S. Army’s recently selected service weapon. FDE Nitron finished slide complements FDE polymer frame. Nitron black controls are aesthetically pleasing and functional. Ambidextrous controls, including manual safety, were part of U.S. Army MHS program specifications. MHS optic cut is another prominent feature of P320-M17. SIG Sauer P320’s fire-control chassis houses ambidextrous slide catch lever, trigger bar, trigger, hammer, slide rails, and associated springs. Chassis allows for modularity of design and is serialized number component of the design. SIG M17 is fed with 17- and 21-round magazines. Extended capacity 21-round mag (shown in pistol) has sleeve to alleviate gap between frame and bottom of magazine. 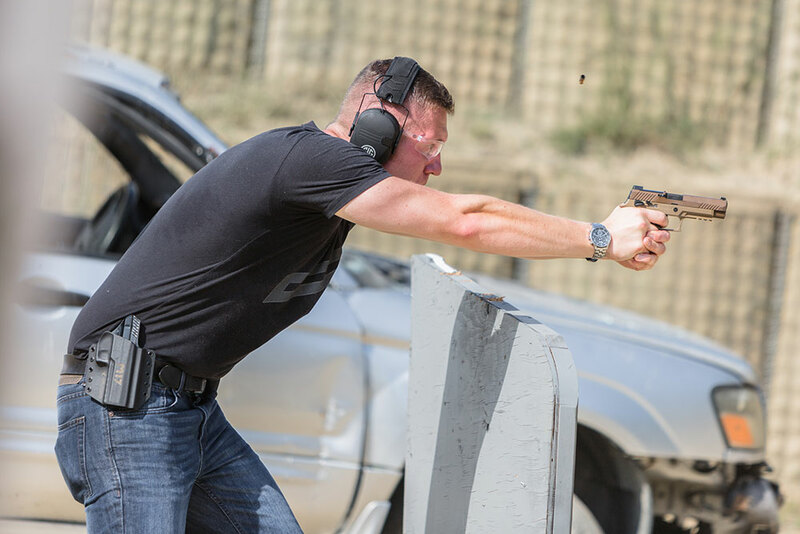 SIG Academy instructor puts P320-M17 through its paces. 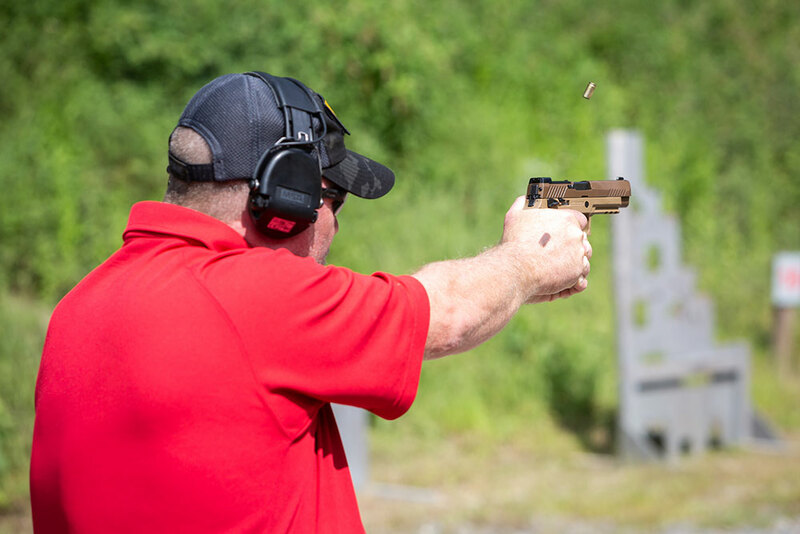 Author takes advantage of range time at SIG Academy with P320-M17. Training scenarios in and around range vehicles and simulated cover provided realistic evaluation format for P320-M17 at SIG Academy. Even under induced stress of drawing against a timer and engaging multiple targets, SIG P320-M17 performed smoothly, with the trigger conducive to accuracy or speed of placing multiple hits on target. SIG P320-M17’s striker-fired design is conducive to rapid controlled fire, with empty case in the air exhibiting minimal muzzle flip. SIG Sauer P320-M17 will surely appeal to federal agencies and law enforcement departments based on its flexible modularity that caters to shooters of all shapes and sizes, not to mention the prestige of being awarded U.S. Army MHS contract. 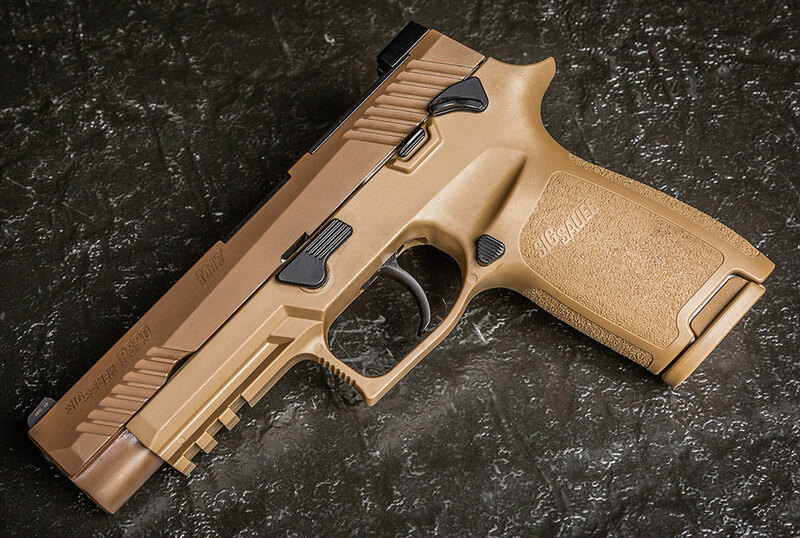 The SIG Sauer P320 was officially introduced at the 2014 SHOT Show. The P320 was SIG’s response to the U.S. market that continues to expand and generate firearm sales among both private citizens and law enforcement consumers, with striker-fired handguns leading the way. The P320 has again been prominent in firearms news of late. 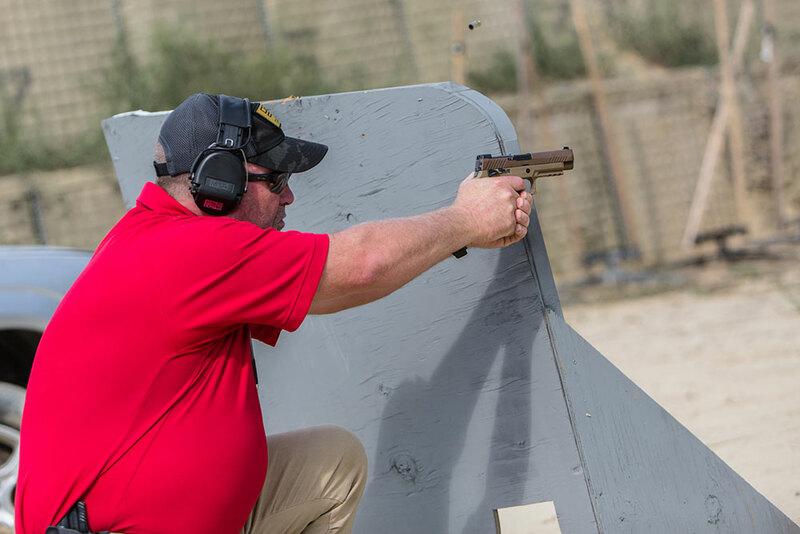 Its selection as the U.S. Army’s new sidearm, after tweaking to meet certain Army specifications in January 2017 via the MHS (Modular Handgun System) Program trials, made headlines and ruffled competitors’ feathers. The first production pistols were in Army hands by October 2017. It is not unusual to see military-pattern weapons embraced by shooting communities outside of the armed services, for example the 1911, M16/AR-15, M14/M1A, Beretta M9/M92, etc. Why shouldn’t private citizens take advantage of the time and effort expended by the nation’s armed forces in determining what works in terms of performance, reliability, and effectiveness? This is not to say military weapons are to be blindly followed, just that several hundred million dollars, countless hours of R&D, and experience making weapons to stringent military specifications should not be ignored. 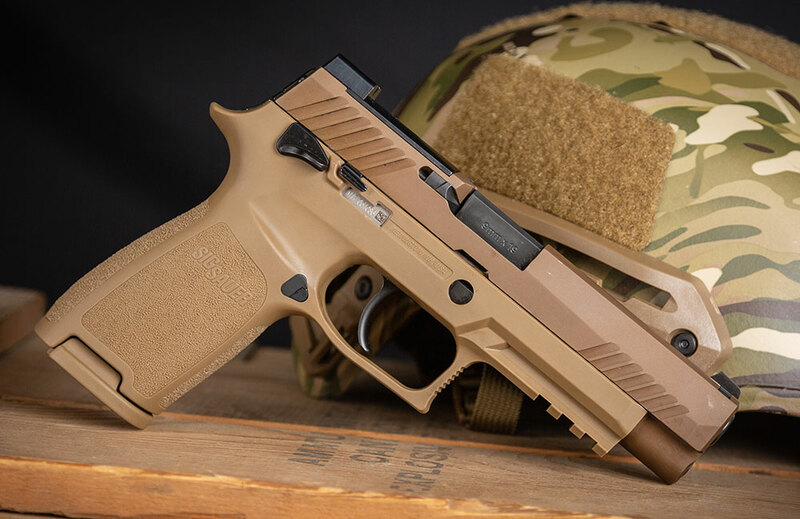 With the blessing of the U.S. Army, SIG Sauer is now making available to the civilian market a clone of the M17 in the form of the P320-M17. Five thousand M17 Commemorative edition pistols will be hitting the market along with the P320-M17. Slide markings on the new P320-M17 handgun will be SIG Sauer P320 and M17. SIGLITE green vial sights are included. The Army M17 and Commemorative versions have green front and orange rear vials. 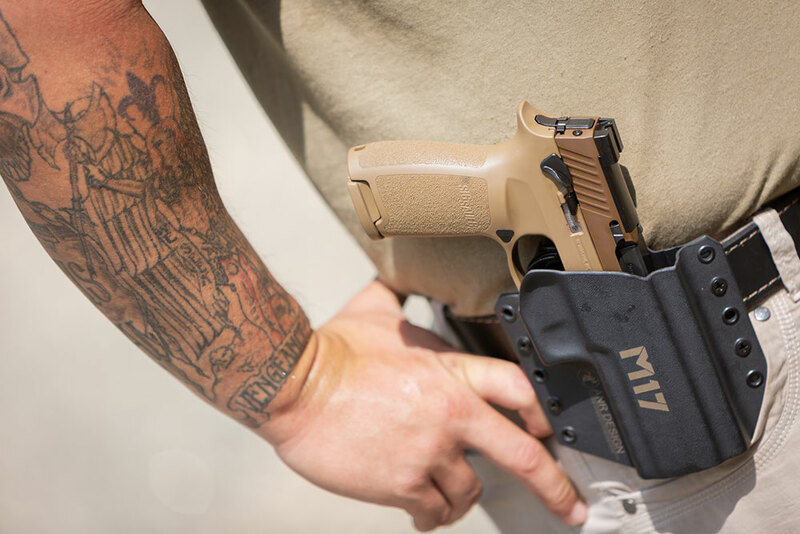 The slide is finished in FDE Nitron with Nitron black controls that are aesthetically pleasing and functional. The P320-M17 has ambidextrous controls, including manual safety. The MHS optic cut is another prominent feature of the P320-M17. The striker-fired, polymer-framed P320 is a departure from traditional SIG Sauer handguns such as the legendary P220 and P226 series, which are more traditional steel-framed DA hammer-fired designs. The P320 benefits from the innovative design features found on an earlier (if not so well received) SIG Sauer offering, the P250. Many heralded the SIG Sauer P250, with its fire control chassis and modularity, as the next stage in handgun development when it appeared. Quite a bold statement at the time of the P250’s arrival, especially considering the cool reception consumers gave it. But the passing of time seems to have validated the P250 concept. The SIG P250’s across-the-board modularity in terms of grip sizes, frame interchangeability combined with various slide lengths, multiple trigger positions, and caliber swapping heralded the next wave of high-capacity striker-fired, polymer-framed handguns. The SIG P250’s adaptability to individual shooter needs seemed too good to be true, and the trigger was not popular. The P250’s trigger pull was similar to a double-action revolver in length and long reset. SIG knew its P250 concept was valid with its modularity, and turned to a striker-fired design to breathe life into the platform with the P320. The heart of the SIG P320 is the fire-control mechanism, or chassis. (For clarity’s sake, SIG Sauer officially refers to it as the serialized stainless steel frame.) The chassis bears the required serial number marking and is the key component allowing for the SIG P320’s modularity. The fire-control chassis fits into a grip module. It is obvious to see the reasoning behind the titles. The grip modules are further adaptable to individual preference, with three different grip circumference sizes available—small, medium, and large. The SIG M17 is fed with 17- and 21-round magazines. The P320-M17 arrives with two 17 rounders. The P320-M17 Commemorative ships with two 21 rounders and one 17-round magazine. SIG Sauer currently employs over 1,800 people located in numerous facilities across five U.S. states, Germany, and Switzerland. Company HQ is in Exeter, New Hampshire. SIG’s horizontal business strategy of creating or acquiring divisions focused on suppressors, ammunition, optics, and training is paying real dividends, as evidenced by the MHS contract award as well as several other military/LE solicitation successes in the U.S. and around the world. SIG Sauer is the largest U.S. exporter of small arms, with their products found in over 80 countries. It is hard to convey the pride felt from CEO Ron Cohen all the way to the factory floor related to the M17 being selected as our military’s sidearm. Yes, the contract is a business success and envied by others in the industry, as seen from those contesting the award. Ron Cohen and many others in SIG Sauer have served in militaries of the U.S. and our allies. The satisfaction of providing a sidearm that was selected after rigorous testing and millions of rounds fired since its inception is immeasurable. I recently attended a two-day seminar hosted by SIG Sauer at their HQ and SIG Academy. The purpose of the event was an in-depth analysis of the P320-M17 and another product that will be revealed at a later date. A huge advantage SIG Sauer’s Director Media Relations & Communications Joel Harris has is being able to access SIG Sauer Academy resources—both range facilities and personnel. Arm bending and hard selling techniques are not required. 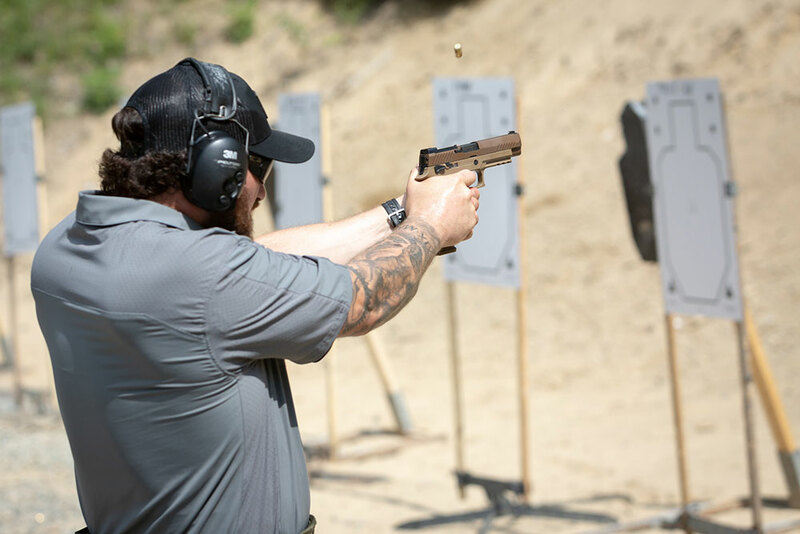 For example, with the P320-M17, SIG Sauer gave a small group of writers a presentation on the platform, handed us a P320-M17, and turned us over to SIG Academy instructors. The best way to let anyone learn or appreciate a product is to let them use it unhindered and without conditions. Multiple scenarios involving shooting/moving, engaging multiple targets behind barricades while switching magazines, working in and around a vehicle, and then running steel plates at every imaginable range from 10 out to 75 yards, left no doubt why the M17 was chosen by the U.S. Army, other U.S. services, U.S. law enforcement agencies, and a growing list of militaries around the world. Polymer-framed striker-fired handguns such as the SIG P320-M17 are inherently lighter and simpler due to the limited number of parts needed to make the gun. Fewer large steel parts are needed, such as a hammer in more traditional designs, thus there are fewer parts to break. This makes the gun easier to maintain and more reliable. The relatively quick adoption of striker-fired weapons for LE and military use bears out this truth. One key with the P320-M17 is the same trigger pull every time. Overall, the SIG P320-M17 trigger is an asset with its consistency. Other factors in the SIG P320-M17’s success are its minimal operating controls, high cartridge capacity to size ratio, relentless reliability, and accuracy. For example, sub-four-inch groups at 35 yards were required for the MHS testing with a new handgun, as well as after thousands of rounds fired. Everyone surely agrees that a properly set-up trigger is a great aid to accurate shooting. My own pet theory is that the P320-M17’s trigger, combined with solid ergonomics, maximizes the P320’s capabilities. Think about any handgun without proper grip, combined with a substandard heavy trigger where aim is surely impacted. The P320-M17’s combination of good sights and trigger—along with SIG quality control—produces a weapon that can run plate racks at 25 yards with monotony. Along these lines, the P320-M17 can deliver multiple hits on IPSC-style targets at close range using point-shooting techniques at three to seven yards—a compliment to its overall design. SIG has achieved near-optimum balance with grip texture—not too aggressive, yet still sandpaper-like, keeping the P320-M17 settled in your hand. Some will appreciate the ambidextrous manual safety found on the M17. I clicked it up and down a few times and then left it off. It provided a solid anchor point for my thumb. The P320-M17 can be ordered without the manual safety, along with an all-black model labeled the P320-M17 Bravo, which is being brought on line soon. With the P320-M17, SIG Sauer’s attention to detail is instantly clear. Crucial items include the magazine release button shape, grip texture, trigger, and maximizing getting the shooter’s hand in proper position for instinctual handling. 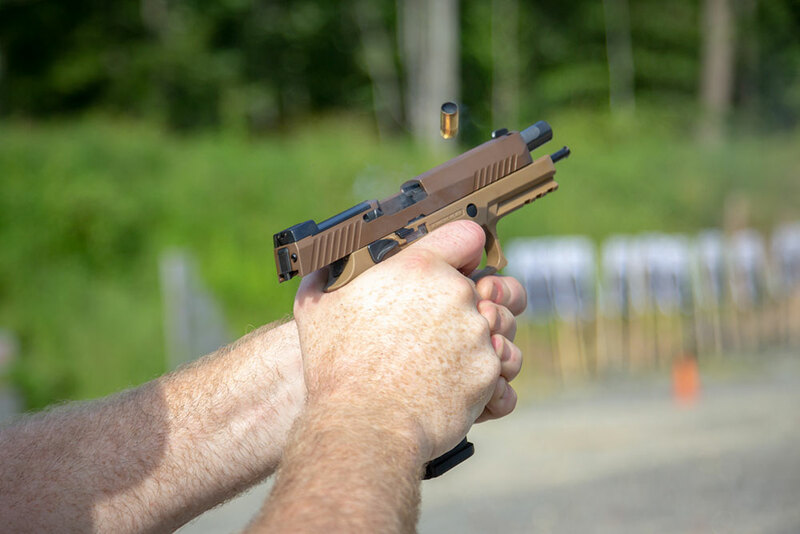 SIG’s years of experience allowed for their engineers to take the nebulous concept of “feel” and translate it to the P320-M17 being one of the best-shooting pistols on the market right out of the box. Many may ask what the SIG P320-M17 offers to shooters compared to other polymer-framed striker-fired handguns already on the market. The answer lies more with refining the striker-fired concept more than anything revolutionary. The P320-M17 benefits from lessons learned, combined with a manufacturer intimately familiar with quality weapon production. The P320-M17’s features mean nothing if it does not perform to the standards SIG is famous for. 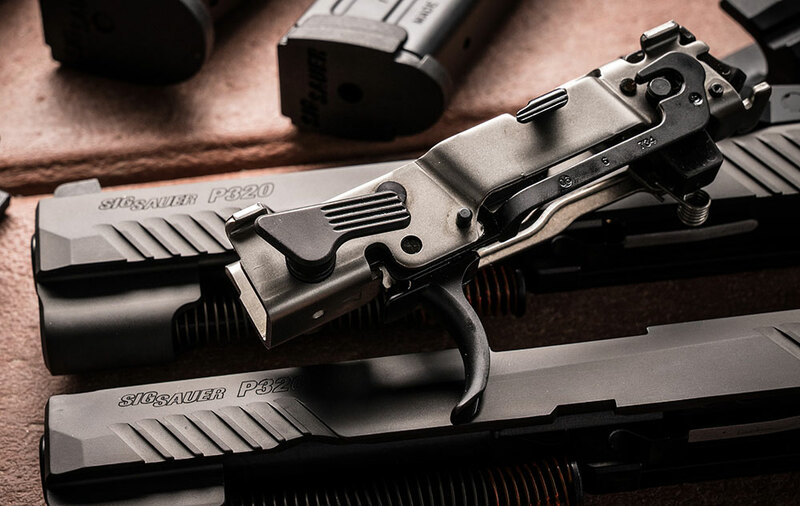 It is truly a worthy handgun that is finding appeal with federal agencies, law enforcement departments, and citizens based on its flexible modularity catering to shooters of all shapes and sizes. This was a big reason why the M17 was awarded the Army contract. The dream of any end user attempting to pick one handgun model is that it performs every imaginable job description with equal aplomb. The SIG Sauer P320-M17 satisfies this quest.